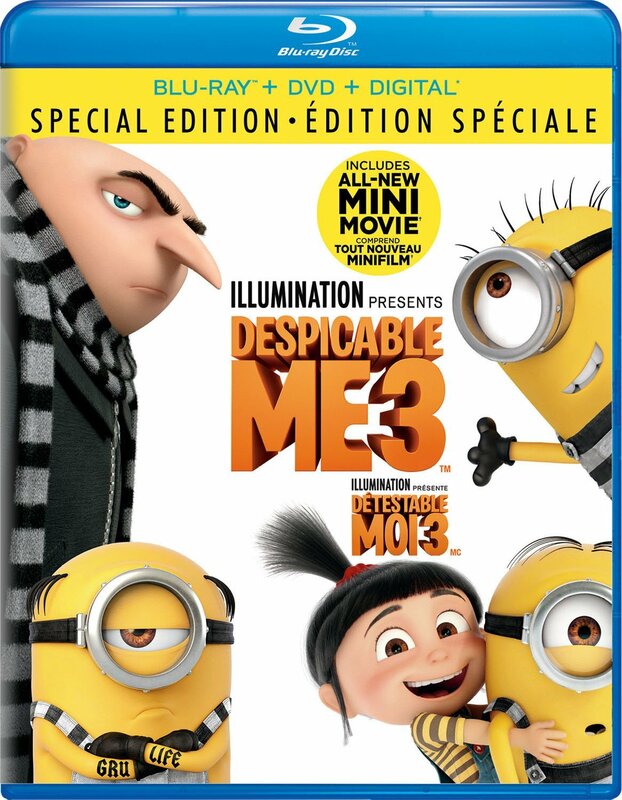 The third installment in the adorably funny Despicable Me franchise is finally available on Blu-ray, and the Minion-ridden, chuckle-inducing movie is certainly a great choice for the entire family! The film begins with former-villain-turned good guy, Gru (voice of Steve Carell), and his wife Lucy (voice of Kristen Wiig) being fired from the AVL (Anti-Villain League) after Gru is unable to stop ’80s-obsessed baddie Balthazar Bratt (Trey Parker) from stealing the world’s biggest diamond. Mel and the other Minions try to convince Gru to get back into the business of being bad, but he refuses, and the Minions decide to head out on their own, only to end up in jail after trespassing on the Universal Studios lot. Meanwhile, down but not out and trying to figure out what he and his wife are going to do for an income, Gru discovers he has a twin brother named Dru (also voiced by Carell) who was raised by their villainous father. Gru is surprised to find he had a father, because his mother told Gru he’d “died from disappointment” after baby Gru was born. Dru is very much the opposite of his brother: he’s blond, bright, and a little too overenthusiastic for Gru, but one thing they share is a love for being the bad guy. Unfortunately for Dru, who wants his brother to teach him the evil ways of the family legacy, Gru is still hesitant about going back to the life he left behind. That is, until he realizes being bad might actually get him back into the good books with the AVL. So Gru devises a plan to get the biggest diamond back — and stop Bratt once and for all. Despicable Me 3 is a great addition to the Despicable Me franchise. Although it isn’t as packed with laughs as the first film, the characters and storyline are just as endearing. Dru and Gru’s relationship is also relatable for many siblings — often thinking themselves in competition with the other, but ultimately realizing they’re family and will come through for each other no matter what. Gru’s relationship with Mel the Minion was also an interesting aspect of the film, and adorable to watch. Speaking of Minions, they manage to steal the show as always and remain one of the best aspects of the Despicable Me franchise. I’m always looking forward to seeing more of their antics on screen. So what’s the final verdict? Despicable Me 3 is a great flick for the whole family. Kids will no doubt enjoy it and parents will get a few laughs out of it. In the new mini-movie The Secret Life of Kyle, we see just what the family dog gets up to while the family’s away. Minion Moments showcases more of the Minions and Gru getting up to their typical mischief. The Making of Despicable Me 3 gives viewers a glimpse into how the film was made. See how Gru’s fun-loving twin brother was created in Developing Dru. Get an interactive behind-the-scenes look at the best agents and coolest gadgets the Anti-Villain League has to offer in The AVL Files. Freedonia Visitors Guide gives viewers a look into the pig-loving, cheese-eating region with an interactive map. Despicable Me TV features some of the film’s best characters. “Doowit” Sing-Along lets fans join in with singer Pharrell Williams as the Minions plot their epic jailbreak! Watch Pharrell do his thing in the official “Yellow Light” Music Video. Also included is a deleted scene, a series of character profiles, a gallery of the Minions’ mugshots and a fun look at their wanted posters. I’m sure it’s very funny and I am anxious to watch it!